More and more organizations are providing customer service tools to encourage consumers to have greater interaction with their brand. In this article, we list 12 useful customer service technologies you can use to empower your customers. Online communities, live chat, customer portals and mobile apps: We’re in the era of the empowered consumer, and businesses are taking note. Customers have a more active role than ever in their purchase decisions, and are able to connect with your customer service staff or with other customers at key touch points throughout their purchasing process. In response, more and more organizations are providing customer service technologies to ensure they’re providing customers with all the tools they’ll need in order to make a good purchase. This is a smart strategy, considering consumer-to-consumer word of mouth generates more than twice the sales of paid advertising. By making services accessible to your customers, you’ll increase the likelihood that your customer will have a good experience and inturn become a brand advocate. Online communities allow customers to engage with other customers, give direct feedback on products, and share their passion for your product or brand. Maintaining online communities is the company’s opportunity to monitor customer feedback and improve brand experience. Online communities can be accessed via social media and there are also several marketing applications that can help you build your own online community (ahem, like our Community Cloud). A forum is a specific type of online community that creates an opportunity for crowdsourcing. Here, you can collect and respond to customer feedback. Popular forums will quickly grow in popularity and become a place where product experts who many not even work for your company can combine forces with your own customer service agents, creating a community that can chime in about a products or help to resolve issues in a much more timely matter. You get the benefit of seeing a lot of customer feedback, and you can see how customers react to the solutions that are provided in the community. Social media is an essential tool for businesses of any size. Maintaining a static social page is not enough. Nowadays an inactive social media profile is the online version of having an empty store. 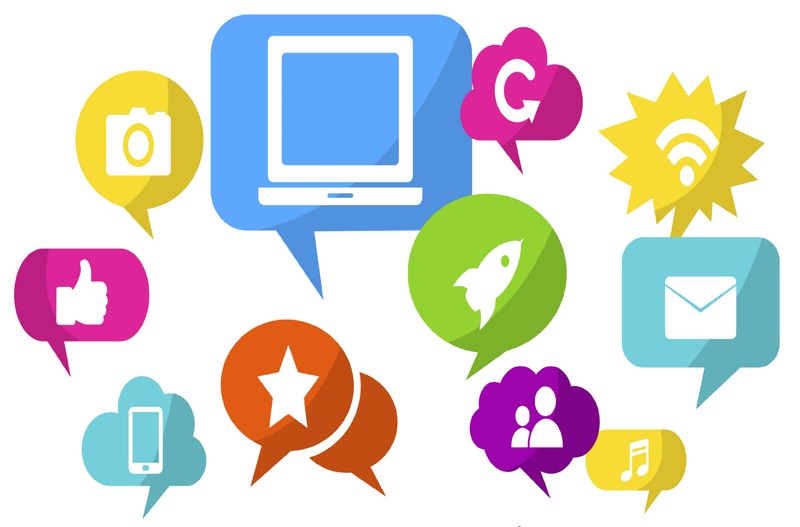 Create a social media presence and use it to engage with customers, connectig with them and responding to their problems or issues on a timely basis. 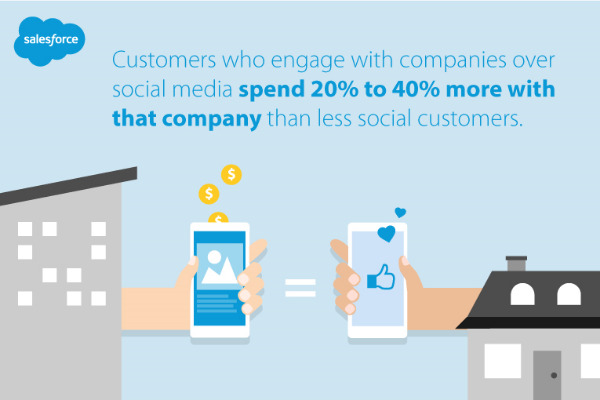 We know that customers who engage with companies via social media channels spend somewhere between 20% to 40% more with that company, so harness that opportunity to increase sales by maintaining good social practices. I personally love it when a company offers up this service. We’ve all had the unpleasant experience of being put on hold for an annoyingly long period of time. By the time an operator is able to assist you, you’re already irritated at having had to wait for X amount of time. If your service system allows a user to enter their phone number for an agent to call them back without losing their place in the service queue, even better. Some phone systems provide an automatic callback option (i.e., dialing the number “six” and then hanging up to have the system call you back when an operator is available), you can more efficiently manage call queues and provide a positive brand experience. Many popular business telephone systems have automatic callback embedded in their services and you should, too. With automatic callback, the customer still waits without having to wait on the line listening to their own music instead of muzak. As more people shopping online, there are people are looking for online support. 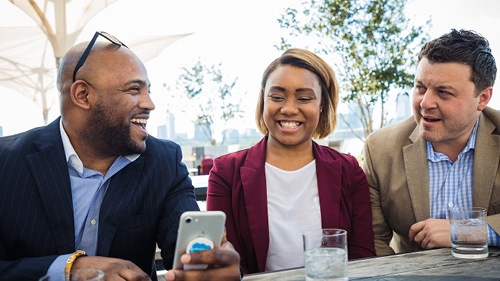 Offering a live chat option (like the one included in the Salesforce Service Cloud) is another way to foster a good online experience for your customers. Live chat options can be used for more than just customer service questions—it’s also a good way to provide information that might encourage a purchase decision. For example, clothing retailers often offer live chat with a “style consultant”, and department stores sometimes offer a live chat for help with gift registries. As an organization, you want to be where the customer is. According to comScore, SMS is used regularly by 75% of all Americans. Considering this, you may want to add a new communications channel into your customer support mix by offering SMS text support as an option. Whereas customer service cases are sometimes opened, handled, and closed via email, SMS texts can reach the consumer immediately via their phone. However, be sure that the customer has opted in before using this tool. Another option is to let your customer have full control over their customer support experience. Several retailers, such as Desk.com, offer branded support sites that help customers solve their own problems. Customers can log in to check case status, and find answers easily from their desktop or mobile phones. This saves time for both you and your customer, and empowers your customer to find their own solutions. Consider offering a free mobile application for your connected customers. Mobile apps can reach consumers in real-time and increase interaction with your brand, an important step when you consider that 4 in every 5 consumers use smartphones to shop and 50% of mobile users prefer to use a customer service app to resolve their issue before jumping on the phone. Serving the customer through a mobile app, which is already optimized for mobile use, provides a quick and easy purchase and resolution experience. 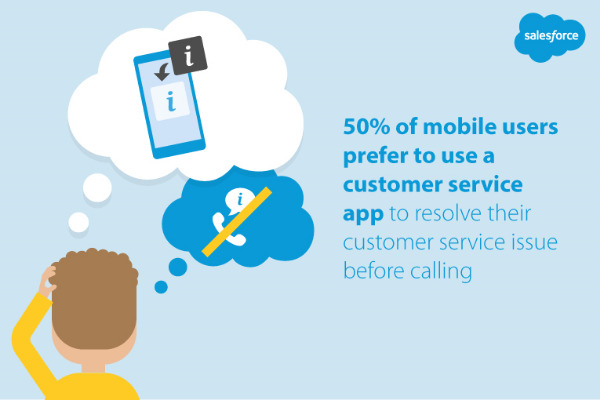 Another perk: Mobile apps keep your company or brand top-of-mind for your customer. 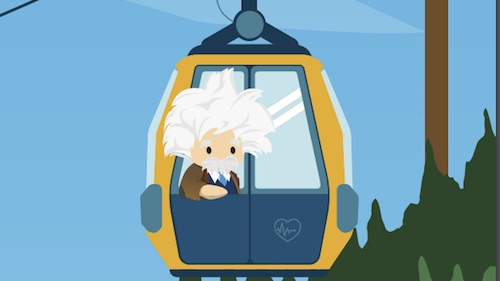 Help ticket or help desk systems, such as those offered through Salesforce’s Service Cloud, help your customer get a quick, accurate answer to their issue. Help tickets can track an issue from beginning to end and your customers can receive notifications as to the progress of their issues, so they know your organization is being proactive. The new trend in this type of customer support is “predictive support”, which means a company can anticipate problems via software, and proactively work on fixing them. Customer satisfaction surveys are important at various touch points, such as after a sale or after an issue is resolved. Allowing your customers to give feedback provides you with valuable information on how to build a better customer journey, and it can help instill trust in your brand. This trust is important to build, because it can cost five to 15 times more to acquire a new customer than gain repeat business from an existing one. A customer portal is a dedicated internal system, usually within your website, that allows your customers access to personal data. Customers can view their purchase history, track orders, save favorite items, or get personalized assistance through their customer portal. Portals allow customers to personalize their shopping experience, which encourages consistent interaction with your brand and repeat business. 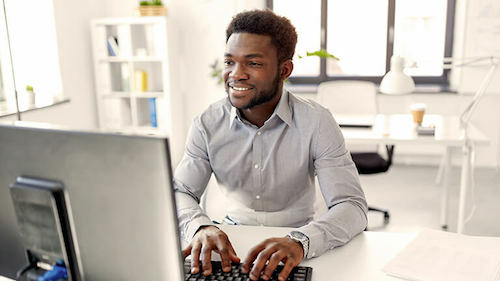 Customers that take the time to nurture their space on your online portal are making a valuable investment in your company by sharing and storing personal information. Another way to enhance the customer journey is to offer connected devices (such as wearables) that can “talk” to one another. With the rise of the Internet of Things (IoT), more and more consumers are gravitating toward devices that can send data to other devices. More companies will continue to harness this trend to connect more intimately with consumers. Investigate this option when loking at ways to improve the experience for your customer. Whether it’s as simple as providing online reviews or as complex as building an online community, you have the power to provide your customers with tools to empower them during their customer journey. The more tools you provide, the greater the chance that you’ll be building brand advocates along the way.